Happy Friday! I hope you all had a wonderful week! I am off to Vegas for an event so follow along on my instagram and snapchat! I got SO many questions of the details in my kitchen so I thought I would do another post and share where everything is from! Caitlin Creer helped me in the build and finishes in my home. I absolutely LOVE everything that we picked and designed together, especially the kitchen cabinets! Designing these was no easy task and she and my cabinet guy did such a great job! I love the detail in the island and floating shelves.We ended up doing oak for the islands so we could get the pretty wood grain we wanted. I am SO happy we used oak! Another favorite part is the fridge, freezer, pantry combo. I love that the pantry is hidden! Below is a full list of everything! Paint Colors: White cabinets are Benjamin Moore White Dove, Wall Color is Benjamin Moore Gray Mist, The gray cabinet color on the islands was a custom stain, you can contact Caitlin Creer for info. Your kitchen is beautiful! This is how I want my dream kitchen to look! 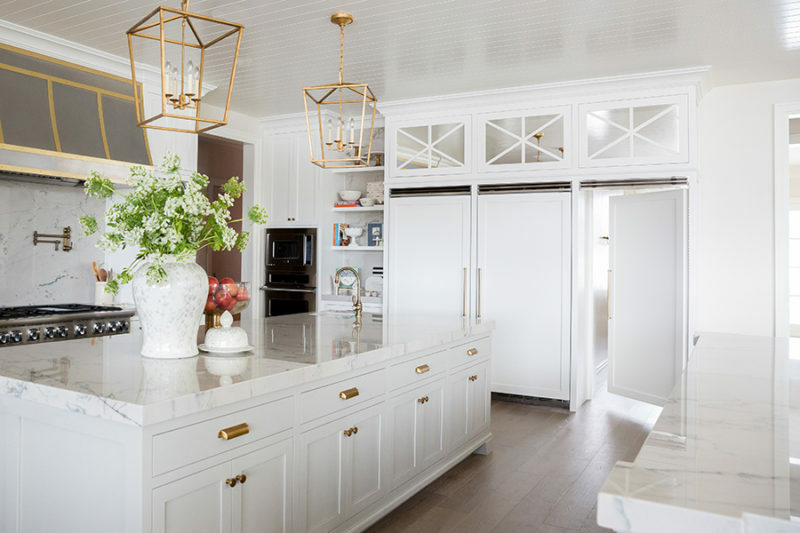 I am in love with this kitchen and every single detail. Such a design dream! I’m with you Tamara, can I just have all of this replicated on my small New York apartment kitchen, sigh! Simply stunning. I’d love to get a glimpse of that hidden pantry!! And the rest of the house. And the exterior!!! The metallic details are so gorgeous. I don’t think I’ve ever seen a more beautiful kitchen! Love your new home, the kitchen counter tops colors are my favorite, great for IG photos right? I like the gold details, they’re not too bright, which make them easier on the eye. Have a lovely weekend! gorgeous! are your countertops marble or what material are they? Your kitchen looks amazing! I wish I had a halfway wonderful one. Thank you for the flooring dealer’s name, but do you know the type of wood and the finish? Your kitchen is absolutely beautiful!!! Amy, did yo receive a reply to your question? I just emailed the same question, would be great to know what color, and finish the floors are. they are gorgeous! I love how bright and open your kitchen is! It’s so pretty!! What are the specifics on the counter tops? Love this kitchen! I can’t wait to follow along with your vegas trip. I love the inside of those cabinets! Swoon! Everything is SO beautiful! 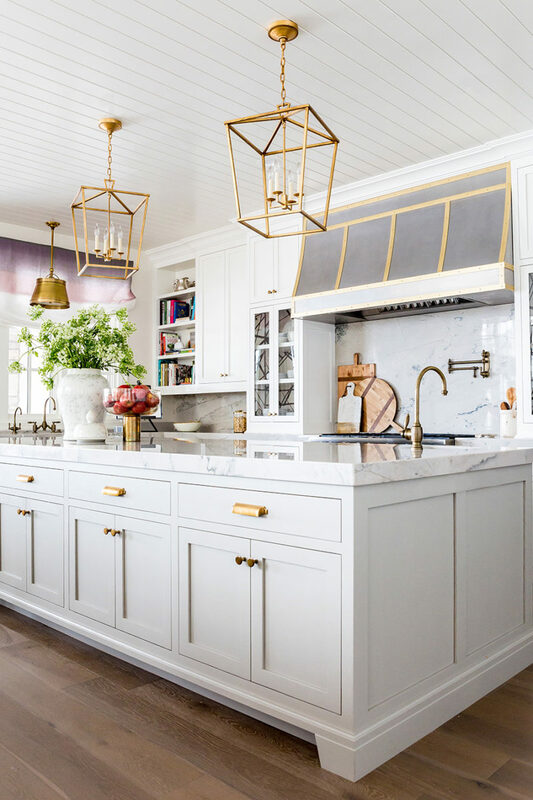 Talk about a dream kitchen – love it all! So gorgeous! Your kitchen is spotless and beautiful! So amazing! How could anyone not want to cook in a kitchen like this? Love! Would love to get details on the cook top hood and also the countertops. I love all of the white! Plus those pendant lights are gorgeous! 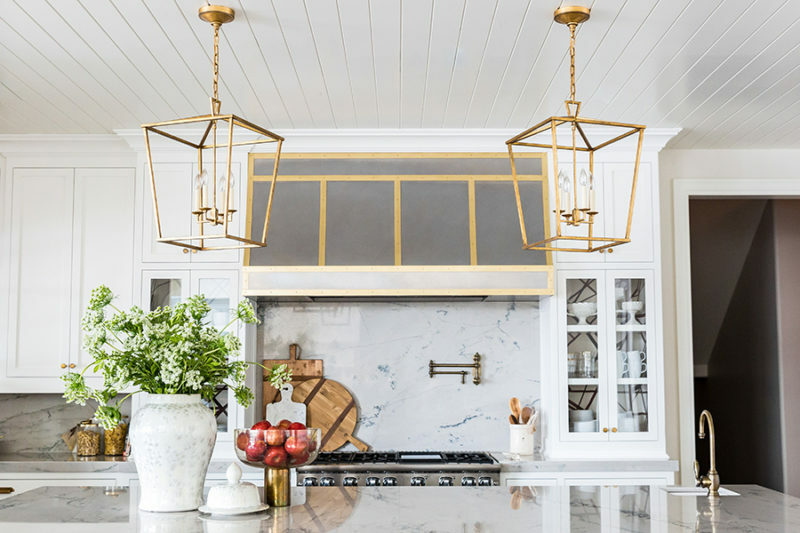 Just stunning, can I ask … is the counter & backsplash marble or quartz? Are you going to do more revealings with your home? Who made the kitchen faucet? I love it (and everything else. Really. ) Beautiful kitchen! Angelina- did you ever find out who made the faucet? I am trying to buy the perfect one right now and it is very difficult to decide. I love this one!! Your kitchen is TO DIE FOR!!!!! I loooove the gold details. You have fabulous taste! Awesome design, thanks for sharing the details. Which floor was it? Name, type of wood? Engineered or finished 0n site? Name of stain? I have the same question! Which floor was it? Name, type of wood? Engineered or finished 0n site? Name of stain? Love your kitchen. 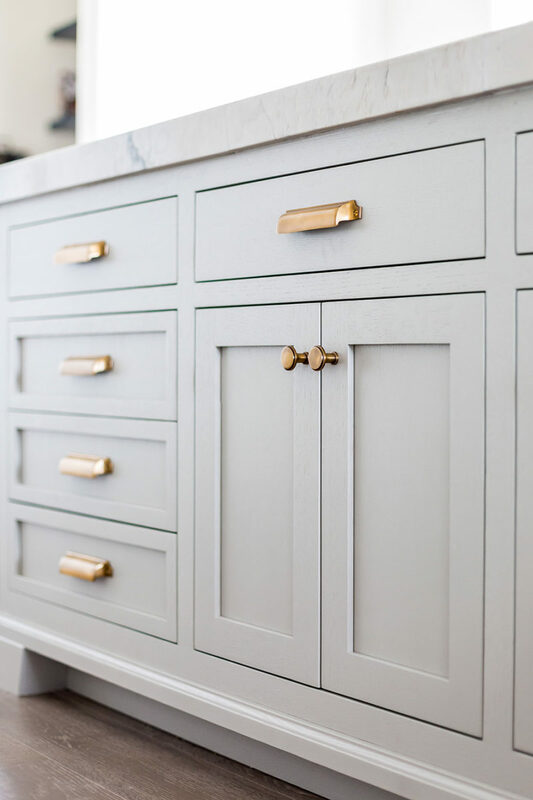 We are in the process of remodeling our kitchen and happen to be doing unlacquered brass hardware. I’m the queen of two-toned…love mixing the metals. We’ll be doing a two-toned hood similar to yours. When I saw the pic of your kitchen, I thought I’d ask where it is from. I am assuming it is custom but if you could point me in the right direction, I’d greatly appreciate it! Can you tell me where your hood is from? Your kitchen is fabulous!! Your kitchen is stunning! Would you mind sharing the island cabinet color? I see it’s a custom mix- do you have the numbers used that I could perhaps have Benjamim Moore try to match so I can see a sample of it? Did you ever get this custom color mix? I’d love to know the cabinet color as well, did you ever find out? I love it! would you mind sharing your faucet/potfiller sources? beautiful and inspirational kitchen! Would love to know the cabinet grey color. Can’t seem to find a grey I like. I love the gray on the island. Any hints as to where I can get it? Pretty please? Did you get your pendants in small or medium? I’ve been looking for ones just like these! Hi Jessica! We have the medium! I hope they work for you! I bet you could ask the installer which size they think would be better for your island! You have perfect taste. This is the most perfect kitchen I have seen! Everything I love the gold! This kitchen is absolutely stunning! Can you share the stainless hood manufacturer? Thanks! Hey – could you tell us where you found the kitchen faucets? I’m having a hard time matching the hardware without being too gold! I would also live to know more about the rangehood. Can you please post details on the custom paint color for your lower cabinets and island?? It’s exactly what I’m looking for, thanks! Can you please tell me how your brass Pottery Barn hardware is holding up? I love them but have read mixed reviews about the quality. THANKS! Pingback: Brand Launch: Theoni - Salted Ink Design Co.
Would you be so kind and let me know the colour of your gray kitchen cabinets? 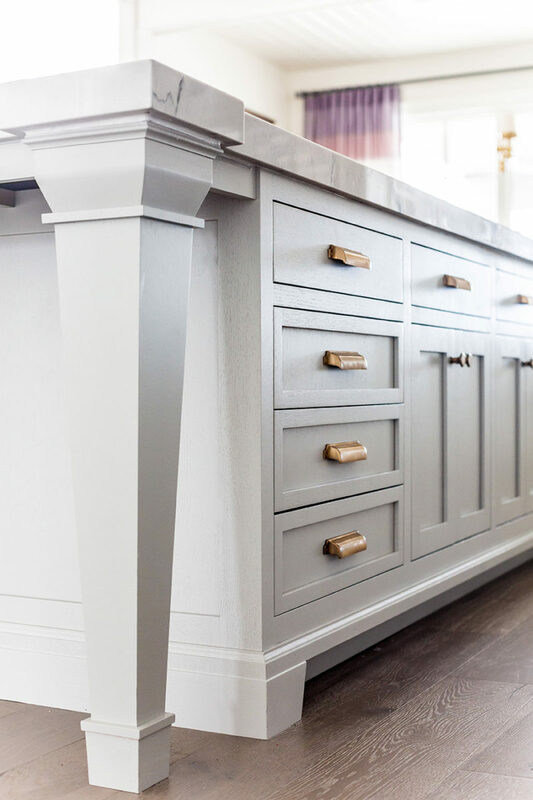 We’re struggling to find the perfect gray for our kitchen reno and yours looks quite stunning. I love your kitchen and I am very interested in the coLor of your island. Can you tell me how i caN contact caitlin Creer? I really would love to know the grey on the island!! Hello, can you PLEASE share the custom color code of the KitcHen island. 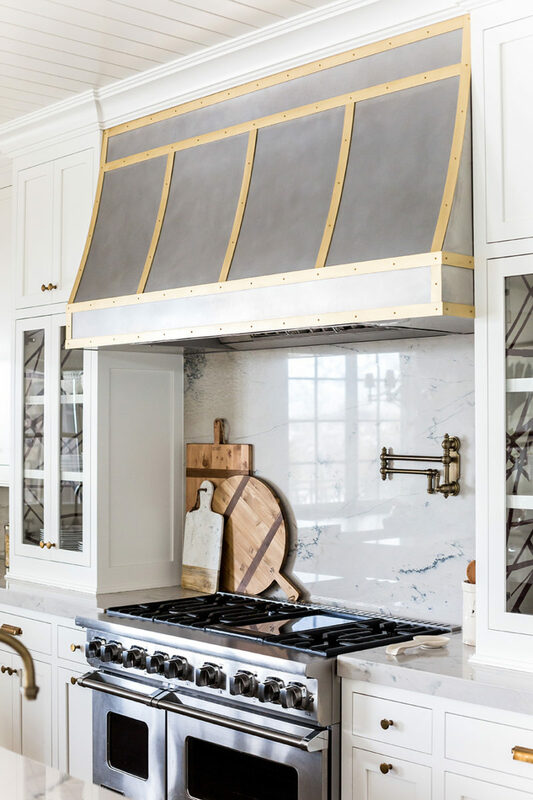 Hi – Can you share the source of the cooktop hood? Love it! Thanks!